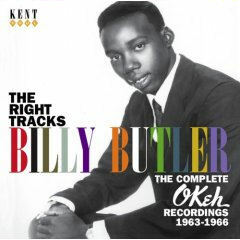 This is a superb collection of Billy Bultler's complete Okeh recordings, the first on CD. Eleven tracks previously unissued, including several backing tracks which sadly never had the vocals by Billy Butler added at a later date. A very detailed booklet by Tony Rounce, gives us all his recording sessions for Okeh + his recording history at Brunswick and beyond. This is a must for the Chicago Soul Sound collector or any fan of great 60's Soul. Issued on Kent CDKEND 280 (July 2007).